Most online stores often have different set of customers. A common scenario is that you will have wholesale customers, retail customers. Wholesale customers often purchase in bulk quantities. So you may want to provide a discount that applies only to wholesale customers. 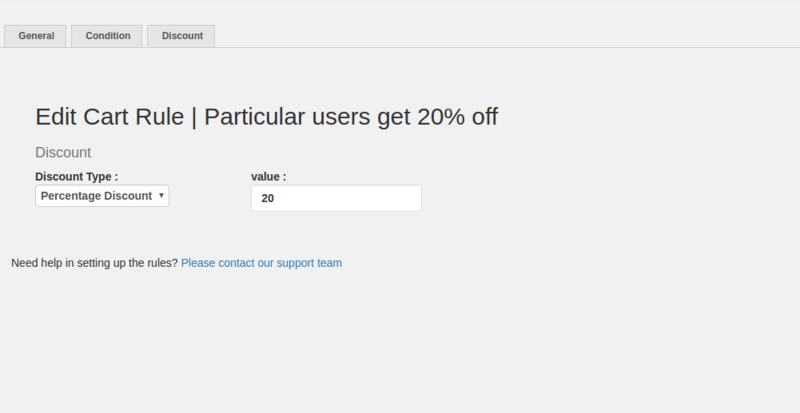 NOTE: User role based discount is available in our PRO version. NOTE: This guide assumes that you have already assigned the wholesale customers to a user role. WordPress provides a concept called user roles. 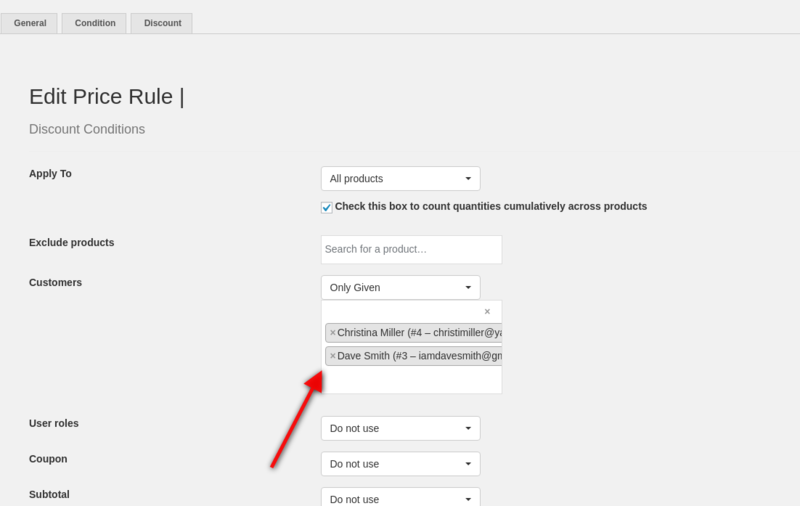 You can use plugins like User Role Editor to create any number of roles and assign users to those roles. If you have not assigned your users to any roles, you might want to consider assigning your wholesale customers to a user role. Let us now proceed with the rule set up using an example. 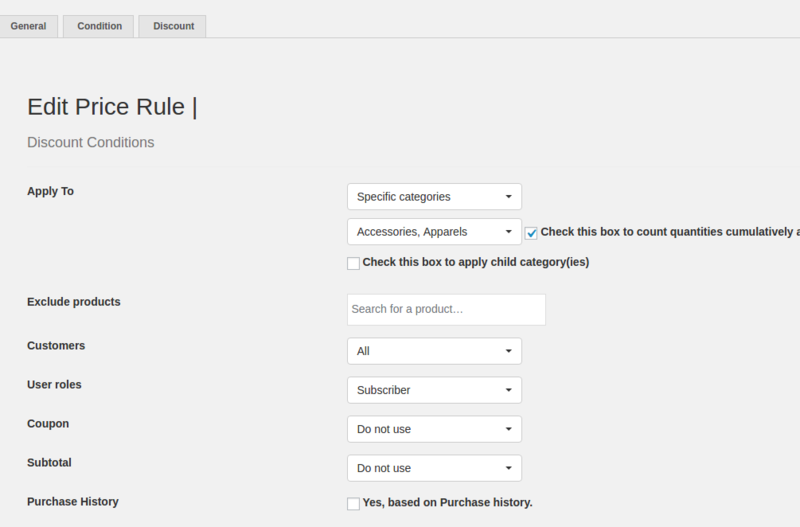 Let's assume that you wanted to provide a 20% discount to customers who belong to the user role "Subscriber"
Notice the field "User roles"
There choose the role as: "Subscriber"
You can choose to apply the discount to all products or specific categories or selected products. Set the conditions as you like. You can select specific categories alone which you need to provide the discount for. Here we have chosen 2 categories for a same percentage discount"Accessories and Apparels". 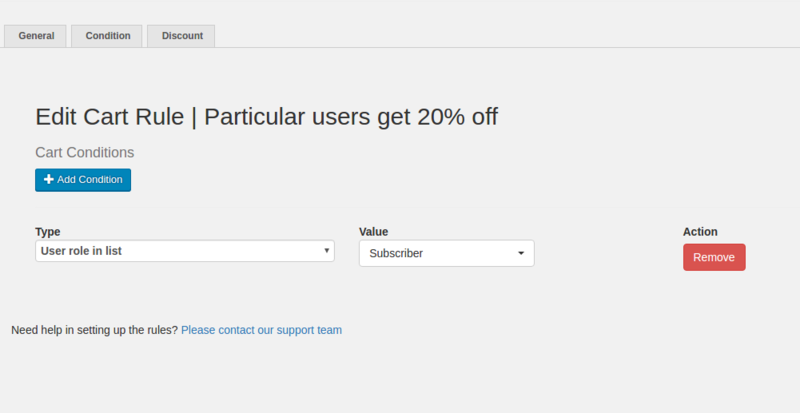 The "Subscriber" User Role will get 20% discount in both these categories. Providing with a percentage discount when 2 to 10 quantities are purchased then give 20% discount. So This rule will apply only to those specific User role. NOTE: If you like to provide different Price/percentage discount for different Categories, then you should create New Rules for Each Category including the same User Role. Once you created the Coupon, then you need to create the User role based discount associated with the coupon code created by entering the coupon code here "SEASONAL". This allows the provided discount when the Coupon code is entered in the cart and also for Subscriber user group. 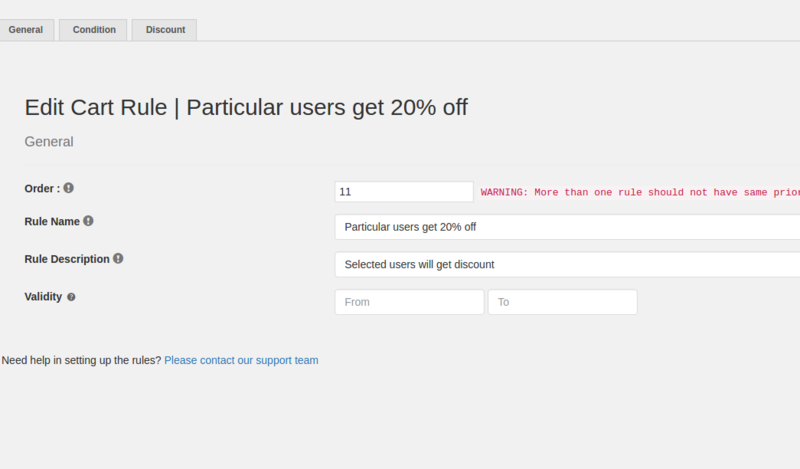 2.How to give discounts to specific Users alone ? 3. 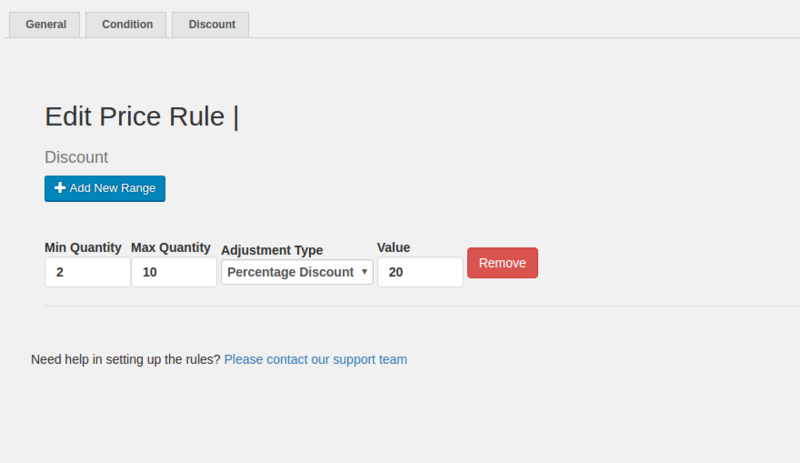 How to create User Role based discount in a cart based rule ? To provide a cart discount for a particular User Role. 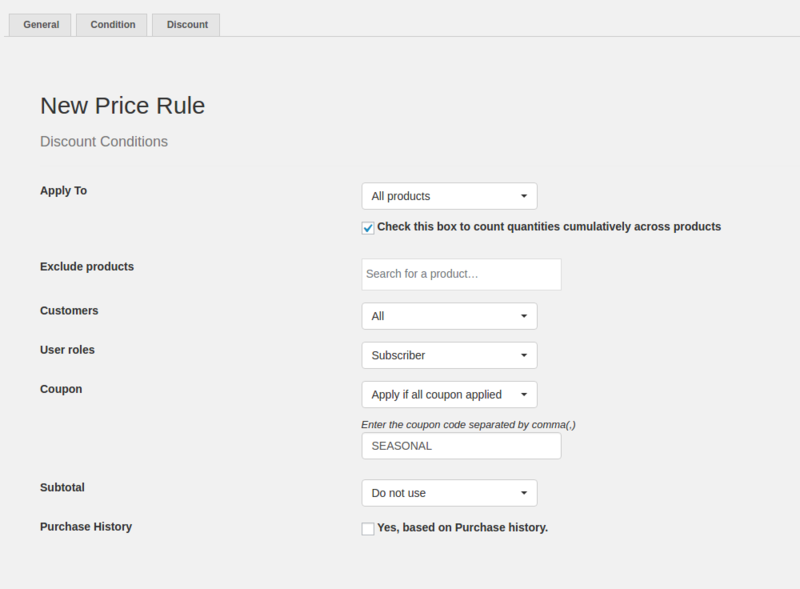 Go to Woo Discount Rules -> Cart based rules -> Create a cart based rule. 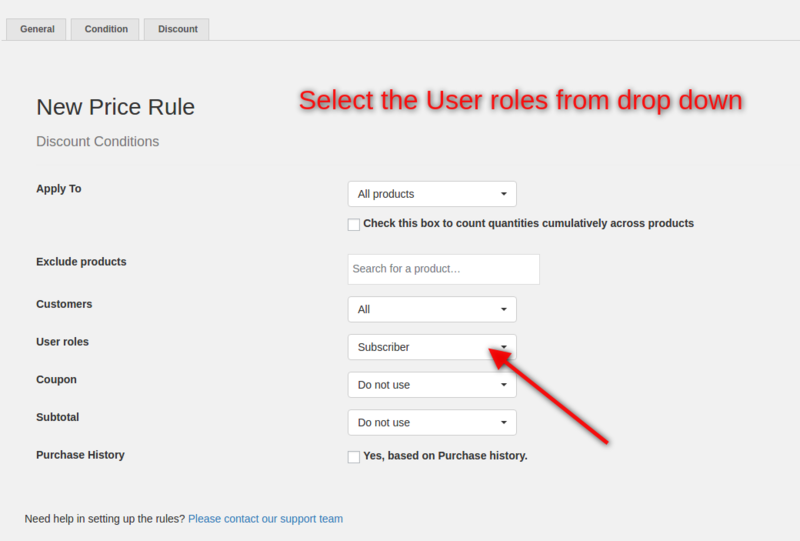 If you want to provide a price or percentage discount for a specific user role in the cart items, you can just select the User role from the list and the provided discount will be applied in the cart for that User group alone. You can also add many conditions to the cart including the User Role added. Like to have the discount should apply only when the cart has specific categories, subtotal at least.